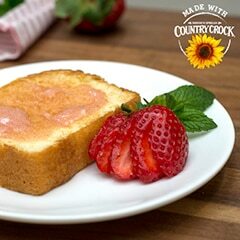 Combine Country Crock® with Sunflower Oil, strawberry preserves and honey in small bowl. Toast pound cake slices until golden, then top with strawberry flavored Spread. Garnish with fresh strawberries and mint sprigs if desired.